Gary A. Kunkel of Cape Coral, Florida (previously Venice, Fl and Boxford MA) died peacefully on Wednesday March 20, 2019 at the Windsor of Cape Coral. Born to Alton (deceased) and Arlene (deceased) Kunkel on November 24, 1932 in Belfast, ME. Gary grew up in Newburyport, MA along with his brother Bruce (Ellen) Kunkel, where Gary’s father was the owner of Kunkel’s stationary. Gary graduated from Worcester Polytechnic Institute in 1954. Four years after graduation he met his self-proclaimed “Sweetheart of my life” Doris Lynch through their mutual interest in skiing; they were married on February 14, 1959. They moved to Boxford, MA and son Gregory became part of their family in 1964 and “added a significant new dimension to our lives.” They recently celebrated their 60th wedding anniversary. Gary embarked on a career for 39 years in the Defense Industry. Over his career he worked at Sikorksy Aircraft, GE Small Aircraft Engines, Avco Systems and for 22 years at Raytheon Missile Systems. Gary found his career “very interesting and challenging” involved in the design and analysis of various military projects, including the Jet Engines and Tactical Ground, Air and Sea Launched missiles. Gary was active in his church in Boxford, First Congregational Church of Boxford. He served on the Deacon Board, initiated the replacement of the Pipe Organ, and with wife Doris sang in the choir. He also traveled extensively with Doris, enjoying multiple trips to Europe fulfilling a dream they had shared since first engaged. He also enjoyed camping and hiking, often with his son Greg as a child, and boating with his family and friends on the lakes and seashores of New England. Upon retirement Gary and Doris began spending winters in Venice, Florida, eventually moving there full time. There he also sung in the choir of Venice Presbyterian Church. 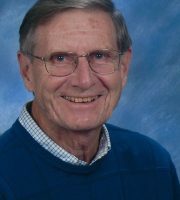 He enjoyed walking the beach with Doris, attending cultural events in Sarasota, playing tennis and golf, and continuing to travel for many years to Colorado to ski as part of the Sarasota Ski Club. Over his final years Gary dealt with Alzheimer’s disease, predicating the move to Cape Coral. Besides his wife Doris, son Greg (Deb) and brother Bruce (Ellen), Gary is survived by several nieces, nephew and great nieces and many friends. Gary is preleased by his parents. Donations may be made in Gary’s memory to the Alvin A. Dubin Alzheimer’s Resource Center, 12468 Brantley Commons Ct., Fort Myers, FL 33907 or to First Congregational Church, 4 Georgetown Rd., Boxford, MA 01921.